Meet the aptly-named Adventure of the Seas®, a ship packed with all the action of our signature innovations-and plenty of time for relaxation, fine dining, and beautiful ocean views. Climb a rock wall that overlooks the sea, or challenge yourself on the basketball court, ice-skating rink or mini-golf course. Achieve perfect zen, poolside or at the relaxing VitalitySM Spa. Liven up your nights on the Royal Promenade, with parades, dancing, and duty-free shopping deals. And bring along some friends-with spacious public areas, enhanced staterooms, and a spectacular three-story dining room, this ship has room for your whole crew. Cape Liberty is the name of the main port of Bayonne, New Jersey, located just across the Hudson River from the New York Passenger Ship Terminal. Bayonne is minutes from Newark and from Ellis Island, home of the Statue of Liberty. Cruise ships that come and go from Cape Liberty are greeted with excellent views of the famous statue. 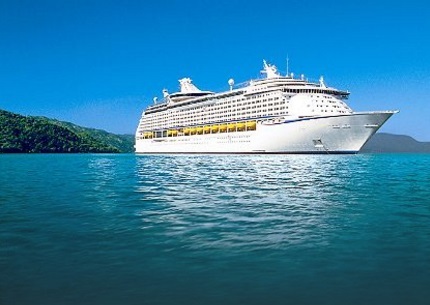 All cruise prices are per person, cruise only, and based on double occupancy. All prices are subject to change as often as daily and are based on availability at the time of the booking. Certain restrictions apply.